Use the word why if you want to probe, especially if the first answer is vague or superficial. Questions beginning with what and how are better for getting people to think about and convey their views to you properly and honestly. When and where are also more specific qualifying questions, unless of course they are used in a general context rather than specific time or geographic sense. Who should be used with care to avoid defamatory risks. Many exit interviewees will be uncomfortable if asked to name people or allocate personal blame. 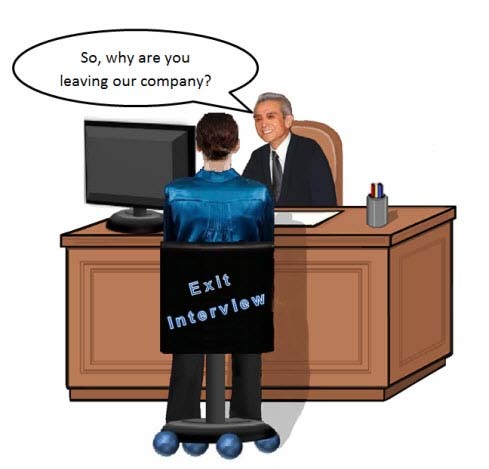 Exit interviews are not about blame, which is not constructive and should be avoided for anything other than very serious complaints or accusations, which must then be suitably referred as follow-up would be beyond the normal exit interview remit. When the interview is complete always say thanks and wish the employee well. The sample question examples are not in any progression, but there is a broad logic to the order of the types of questions. There are many more questions provided than you would normally ask in a typical exit interview. Pick the questions that are most relevant to the leaving circumstances, the interviewee and your office. Tell me about how you have come to decide to leave? What could have been done early on to prevent the situation developing/provide a basis for you to stay with us? How do you feel about the organization? What has been good/enjoyable/satisfying for you in your time with us? What has been frustrating/difficult/upsetting to you in your time with us? What extra responsibility would you have welcomed that you were not given? How could the organization have enabled you to make fuller use of your capabilities and potential? What training would you have liked or needed that you did not get, and what effect would this have had? How well do think your training and development needs were assessed and met? What can you say about communications within the organization/your department? What improvements do you think can be made to customer service and relations? How would you describe the culture or “feel” of the organization? What improvement could be made to the way that you were inducted/ prepared for your role(s)? What can you say about the way your performance was measured, and the feedback to you of your performance results? What would you say about how you were motivated, and how that could have been improved? Can you provide any ridiculous examples of policy, rules or instructions you have encountered here? What examples of ridiculous waste (material or effort), pointless reports, meetings, bureaucracy, etc., could you point to? How could the organization reduce stress levels among employees where stress is an issue? How could the organization have enabled you to have made better use of your time? What can the organization do to retain its best people (and not lose any more like you)? Would you consider working again for us if the situation were right? Are you happy to say where you are going (if you have decided)? What particularly is it about them that make you want to join them? What, importantly, are they offering that we are not? (If appropriate) Could you be persuaded to renegotiate/stay/discuss the possibility of staying?